Uniden BC365CRS "Bearcat" 500-Channel Scanner / Weather Alert / Alarm Clock | BUDK.com - Knives & Swords At The Lowest Prices! 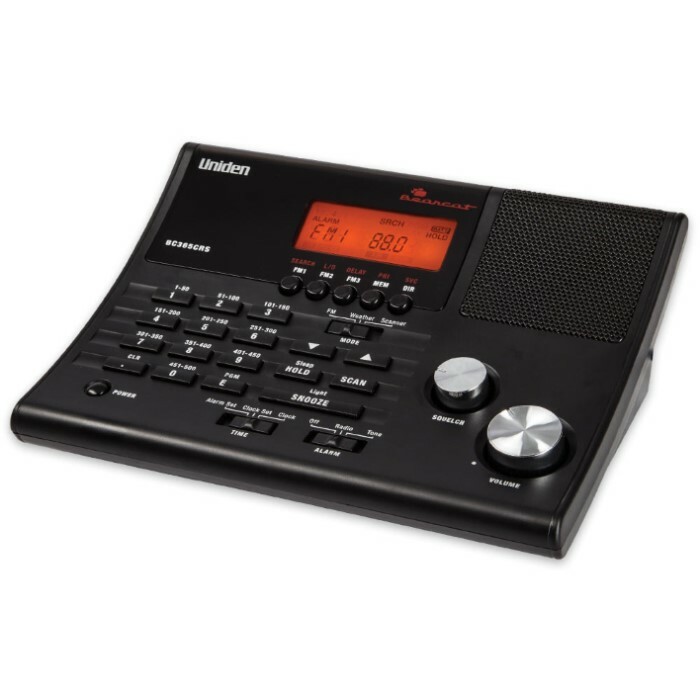 Perfect for veteran radio aficionados or beginning airwave dabblers alike, the Uniden BC365CRS “Bearcat” is feature packed and user friendly. It includes 500 channels for scanning local public safety and other interesting frequencies; a weather alert scan, a traditional FM radio and even an alarm clock! Sleek and modern, the multitalented Bearcat boasts a fresh design that's attractive on your desktop, kitchen counter, bedside table or practically anywhere else. It’s easy to read at night through the crystal clear backlit LCD display. Buttons, dials and other controls are cleverly arranged for ease of use, so there's no fumbling around in the dark. Despite its versatility and wide assortment of distinct features, the scanner is still the heart of the Bearcat. Five hundred channels in 10 separate banks afford ample space for storing frequencies for weather spotters, local businesses, emergency services and more. Store your most important frequencies in "priority channels." While scanning, the Bearcat checks these channels every two seconds, so you're more likely to catch activity that's valuable or interesting to you. The "do not disturb" setting prevents priority checks when you're actively receiving a channel. This keeps the audio from breaking up every two seconds during the priority check. Ideal for reporters and other people who closely follow local events, the Bearcat lets you easily search bands commonly used by law enforcement, fire departments, EMS, aircraft, amateur radio, marine vessels and more! Anyone can benefit from the Bearcat's great range of features, however. The weather scan / alert system lets you listen to local weather reports and receive alerts when hazardous conditions arise. Even the FM dial is loaded with bells and whistles, like 30 channel presets for instantly tuning in to your favorite local broadcasts. A rare feature among scanners of this caliber, the built-in alarm clock lets you wake to your favorite radio station or even communication channel scanning. The all-important snooze button lets you grab a few more minutes of shuteye, while the sleep function automatically turns off the Bearcat at a time you set. With so much going for it, if you weren't a radio geek before, try Uniden's incredible BC365CRS just once and you're to be one soon!